The owners of this immaculate double storey home have renovated to create a family haven that is both beautiful and functional. Set on a 703 sq.m corner block in one East Mackay’s best streets. The home features 3 bedrooms and a bathroom upstairs and a bedroom, kitchenette and second bathroom downstairs. Downstairs is a very versatile space and is ideal as a home office or guest room for visiting friends & family. Upon entry from Hoey Street you are greeted with tropical gardens and decking that leads upstairs to the private front balcony. Sliding doors open to the lounge and through to the kitchen and dining area that will “knock your socks off”. The kitchen features; island bench, European appliances, pantry and dishwasher. The upstairs living areas are designed to capture the breeze and the large air conditioner helps on sizzling summer days. Branching from the hallway are 3 built-in bedrooms with fans and 2 offer air-conditioning. The bedrooms share a stunning bathroom with floor to ceiling tiles, double shower head and feature lighting. Downstairs renovations have created an independent air-conditioned granny flat boasting; built-in bedroom, second bathroom, kitchen, rumpus room and large laundry. The entertainer’s deck overlooks the sparkling pool and manicured gardens. Remote control garaging for 1 car + plenty of storage space and a 2-bay carport. The fully fenced block offers a front and rear yard, two sheds of 3m x 3m and 6m x 3m and solar power/hot water. Situated in a quiet location close to Town Beach, great schools and Mackay’s CBD – don’t miss the opportunity to secure your “forever home” now. Under Contract Subject to Conditions. 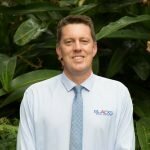 We have a large and solid based clientele along with an in-depth knowledge of the real estate business scene in Mackay, with which we have grown.